A look at the global surface temperature evolution makes one thing very clear: claims that global warming has “stopped” or “slowed” are not exactly supported by the recent data. Last month was not just the warmest April on record, it also beat the previous April record by the largest margin since the beginning of record-keeping in the year 1880. (April 2016 was 0.24 °C warmer than the previous record April 2010; this margin was three times larger than the previously largest margin of 0.08 °C.) In fact, February was also the warmest February, by the largest margin on record. And January was the warmest January on record. Yes, by the largest margin. 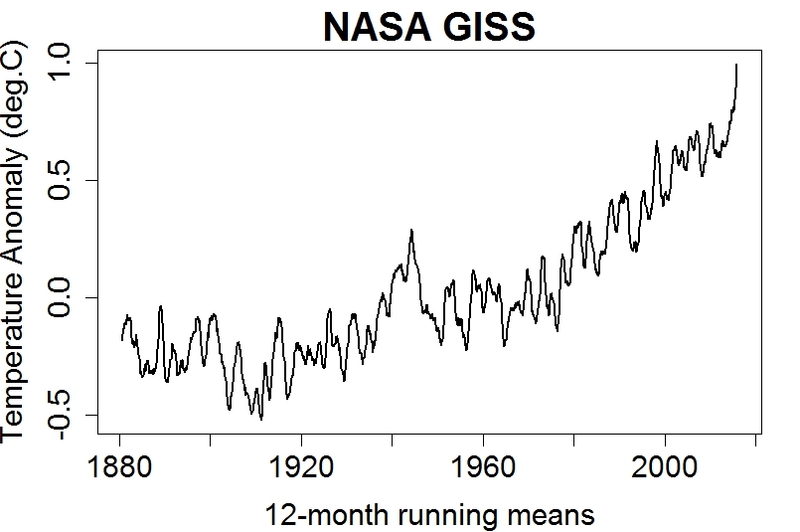 The running 12-month average global temperature (Fig. 1) is reaching new unprecedented heights every month.